Hey, remember when Donald Trump once retweeted a poorly animated GIF of one of his WWE appearances, where he clotheslines a person that has the CNN logo on their face? Yep, our president actually did that. There was a lot of backlash to the retweet, mainly because it's something a 13-year-old would do to try and make a "serious" point about the politics of specific media agencies. Or as a joke, you know, in a kind of look-at-how-dumb-this-gif-is-lol kind of joke. 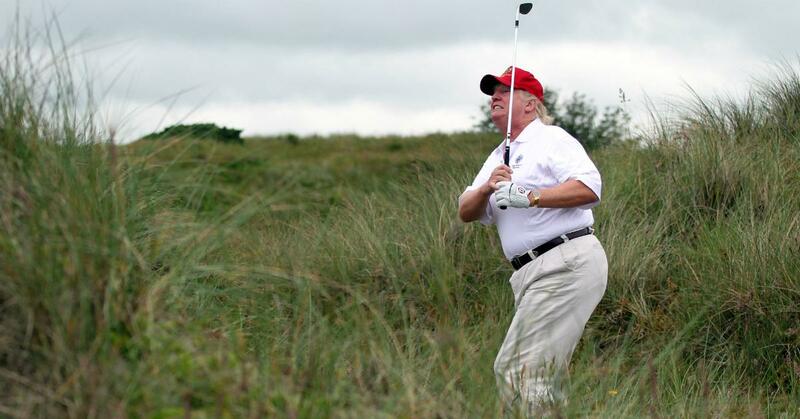 Well, it looks like Trump is at it again with retweeting GIFs, because the president just retweeted this GIF of him clubbing Hillary Clinton in the back with a golf ball. The GIF came as part of a reply to this recent tweet of Trump's, where he still, months after securing the presidency, continues to talk smack about Clinton. The "deplorables" came back to haunt Hillary.They expressed their feelings loud and clear. She spent big money but, in the end, had no game! Criticizing the former Secretary of State was a huge part of Trump's campaign, but with the President getting shut down by both the Senate and Congress despite having a Republican majority house, many are wondering if that's all Trump is capable of doing to garner support from his constituents, aside from disparaging those who have retired from active office. Other people who saw Trump's retweet were in disbelief. Third world countries are watching the quality of a man the United States has for a president. He is a profoundly damaged individual. Should not be in office. The retweet also had others who missed having a president who acted with some dignity speaking out. I miss having someone who acted like a President. Not some small child who likes to play in big trucks, and humiliate everyone.